If you are unfamiliar with Jenny’s line of LobotoME organizing products, let me recommend you check them out right now. I’m a huge fan of the notepads and specifically the fun Fit Me exercise tracking pads. I like her products because they recognize that organizing doesn’t always have to be extremely serious. Her office is where the business of LobotoME takes place. I like her storage cabinet with the chalkboard covered doors, her separate computer and work surfaces, shelves that keep books off the desk, the printer stand that also includes storage, and the on desk file holder that keeps active folders from having to be stacked and cluttered. I had no idea that Jenny was going to grace our Flickr pool with her office photographs, and I’m so glad that she did. It’s fun to see where work you’re familiar with takes place. 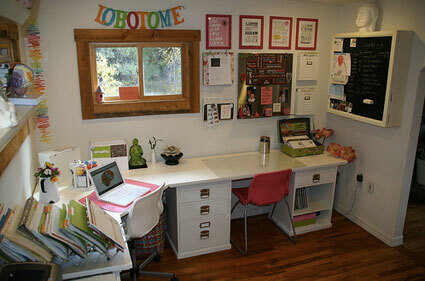 Thank you, Jenny, for submitting your LobotoME office. I like the motivational sign that she on the wall to the left of the bookshelves. It looks like it might say “Keep Calm and Carry On”. It’s nice to have a few things around your workspace to motivate and encourage. I like how this is neat and organized without that minimalist dullness – there is plenty of color and things, without it being cluttered or crowded. I think it’s great, too! 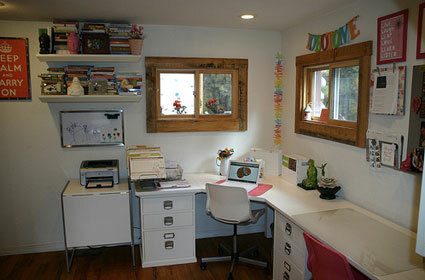 Cute workspace, but it seems slightly cluttered to me (e.g., the two high shelves filled with stuff). Love, love, love this space! I would take it in a minute – bright, cheery look that would keep me motivated to keep it clean. Thanks for posting it. Re: keep calm poster – I read an article on another site all about this saying from WWII England (the crown is on the top)and how it has been revived and posted all over England again. And there is a counter movement/poster that says “Get excited and make things”. Very funny!